in Australia, designed to help the public match their policy views with the official platforms of Australian political parties. Vote Compass (votecompass.ca) was developed by political scientists in Canada, where it has been used for both Canadian and US elections. Asides from helping citizens discover which political parties their policy views match, it has been used to stimulate discussion and engagement and identify the underlying policy concerns in the community. It is particularly useful where political parties do a poor job (sometimes deliberately) of making their policies accessible online in comprable formats to allow citizens to easily understand where parties stand on specific issues and what they offer voters. Unfortunately it is not always in the interests of political parties to make all their policies widely known. Either because they don't clearly differentiate the party, they have not had significant costing and scrutiny or they might place sections of the community offside if they were widely communicated (such as the now abandoned internet filtering policy released by the Labor party five days prior to the 2007 election). Some substitute services have emerged - notably the Australian Christian Lobby's Australia Votes site, which compares party policies from the perspective of a particular Christian perspective, the sadly defunct GovMonitor site, and the ABC provides a basic comparison each election. They do it a little better in the UK, where the Vote for Policies site provides a comparison of the policies of six parties and allows people to 'place' themselves via their views. I've also suggest the creation of an XML schema for party policies to provide a consistent way for the public to view and compare policies. As this relies on either the support of political parties to adopt the approach, or a community-based organisation to do the 'heavy lifting', I don't see this as a short-term goal. Services such as Vote Compass are therefore important democratic tools to ensure that citizens have an informed vote in elections, even if political parties would prefer them not to. 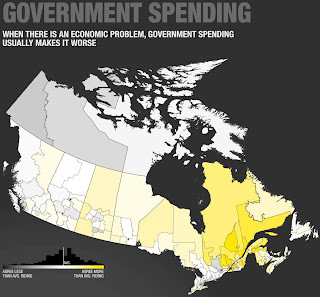 However they also have potential value for the public service and government as well. 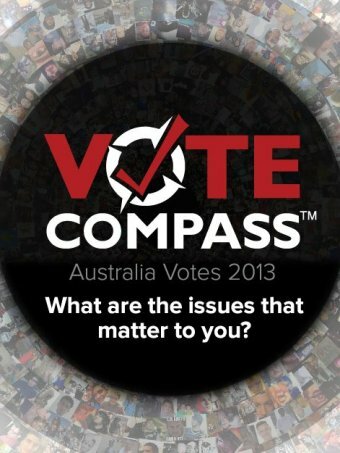 Vote Compass, and similar tools that ask citizens where they stand on policy issues, can provide a far more granulated view on the attitudes and concerns of the public than single policy studies or broadbrush voting polls. 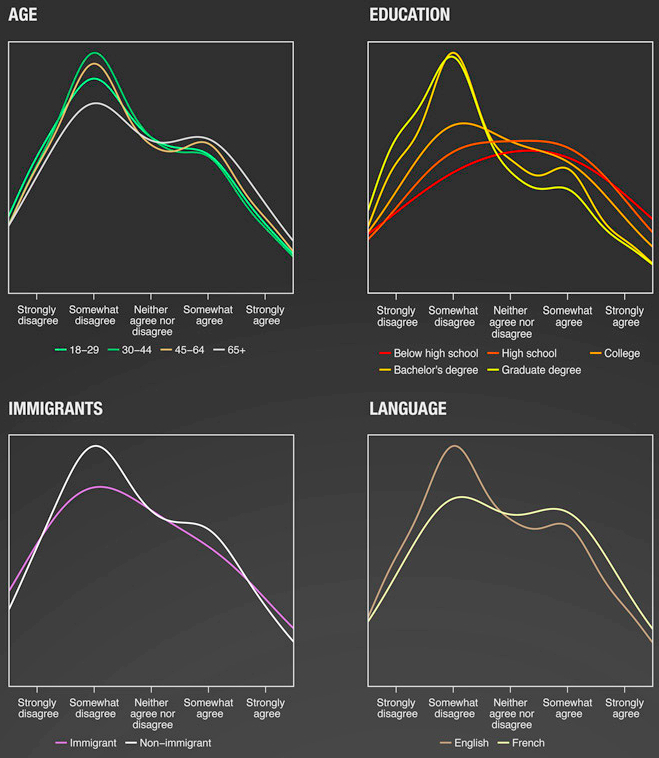 With a little demographic data - age, gender, education level, employment status, postcode and maybe a few others - having a view of citizens across policies helps identify and group audiences and map affinities based on similar policy groups (social services, foreign policy, education and so on). 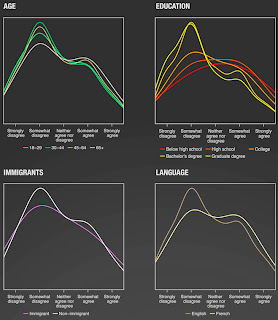 This type of cross-policy data is rarely collected by agencies, who focus almost exclusively on their own policy areas and may miss insights or opportunities across policy domains - similar to how scientists in specific disciplines can miss cross-discipline insights, such as the application of physicists' chaos theory to biological populations or to fluid dynamics. Where this data is being collected by entities outside of government (even the ABC, which tends to remain at arms length), these insights may not be realised or accepted by policy areas within the public sector. In my view this makes a decent case for the government to consider adopting or developing tools similar to Vote Compass to help provide agencies and politicians with better insights into citizens, while simultaneously using these tools to give citizens better insights into government policy alternatives. Certainly this type of information would be useful for the localisation of policy delivery by region - which may make the Department of Regional Australia the logical manager of the process. For this to happen there would need to be an understanding within government that improving the public understanding of policy positions is a benefit to democracy, rather than a partisan activity designed to support a particular viewpoint. Also there'd have to be a consistent and open way of sharing the information, so it isn't limited to the party which happens to hold government - such as the public release of an online 'policy map' which map policy views on by electorate, age, gender and other demographics in an appropriately anonymised manner. Of course an organisation such as the ABC might take Vote Compass a little further and, rather than simply using the data they collect to map views to customise reporting across their local radio network, could release it publicly to help everyone. Should governments rely on media organisations, even publicly-funded ones - to provide this kind of public service? Or should the education of voters and the use of insights from citizens to inform policy decisions and local delivery be a primary concern of the core of government?